The reactivation of faults and the generation of fractures can be caused by stress changes due to injection and/or production of fluids into and/or from the subsurface. The simulation of these processes, which could be associated with (micro-)seismicity, is affected by a high uncertainty. 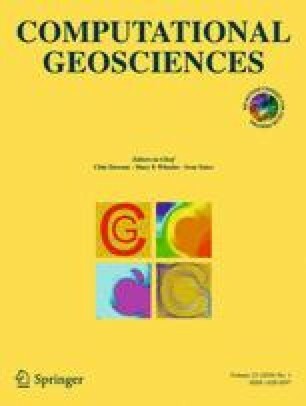 The aim of this work is at developing a mathematical framework to quantify and possibly reduce the prior modeling uncertainties by assimilation of seismic data. The mechanics of fault (re-)activation is simulated by a Finite Element (FE) numerical model where the discontinuous displacements between the fault surfaces are suitably considered using appropriate Interface Elements (IEs). The study is carried out by using a stochastic approach, with a global sensitivity analysis (gSA) based on Sobol’ indices initially performed to estimate the influence of the input parameters on the model solution. Then, a Markov Chain Monte Carlo (MCMC) sampling technique based on the generalized Polynomial Chaos expansion (gPC) surrogate solution is used to update the prior information conditioned on seismic observations. The methodology is tested on a 3D synthetic test case. The uncertain input is the natural stress regime and the Mohr-Coulomb parameters characterizing the fault activation criterion. A good reduction of the prior uncertainty is obtained, showing that the assimilation of seismic data can have a promising potential for improving the subsurface characterization. The research has been carried out in the framework of the UNESCO IGCP 641 project “Mechanisms, Monitoring and Modeling Earth Fissure generation and Fault activation due to subsurface Fluid exploitation (M3EF3)”.